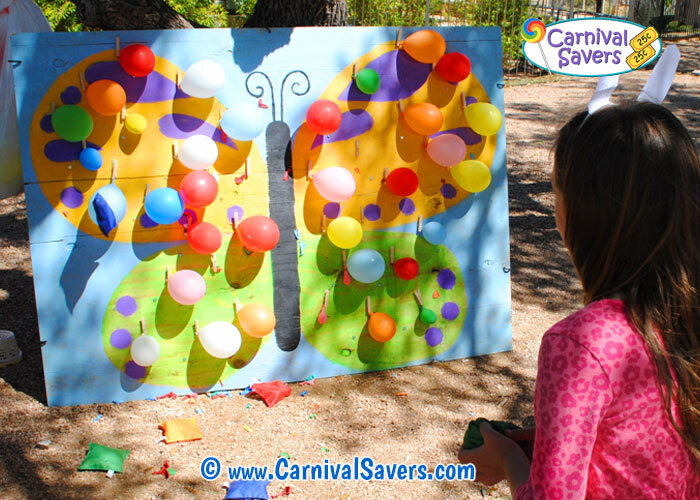 Butterfly Balloon Burst - Unique Spring Carnival Game! Spring Game Idea - Butterfly Balloon Burst - No Darts Needed! 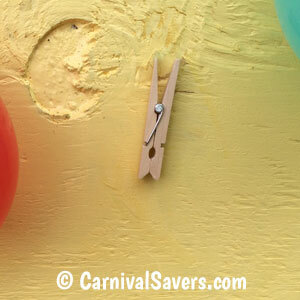 Clothespins (Nailed on Board) to Keep Balloon in Place. 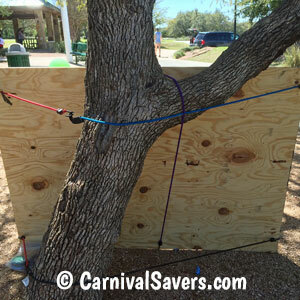 Copy the Pros - Hang Your Prizes for Kids to See! Days/weeks before your carnival, draw a butterfly design on your board and paint with assorted the acrylic paint. After the paint drys completely, have an adult attach the medium sized clothespins to the board (on their sides - see image above) about 8 inches apart using 1 inch long, thin nails. Note: We tried attaching the clothespins flat to the board, but found sometimes when a players tossed bean bags, they hit a clothespin and released a balloon! 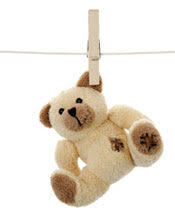 By attaching the clothespins on their side using a nail through the metal part of the pin, this does not tend to happen! To attach the tacks to the board. Each tack should be about 4 - 5 inches below each clothespin, again using the hot glue gun. If the tack is "dead center" under the balloon, the balloons will be too easy to pop! You can also make some of the tacks "off center" by about 2 inches, to make this game a little bit more difficult! A few days before the carnival, volunteers inflate balloons and place in large garbage sacks (that have weights like baseballs) to prevent them from blowing away at an outside event. Volunteers will clip the balloons on your game being careful to watch for the tacks on the board. 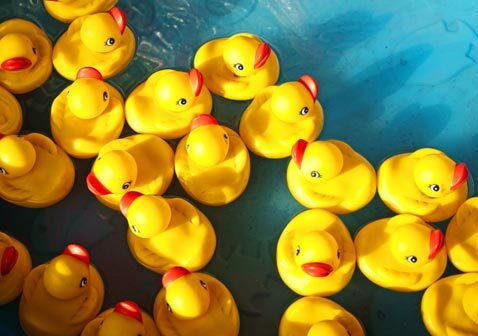 Set out your stand behind lines, ticket box and display your prizes! Players are given 3 Bean Bags for a chance to pop a balloon (or more) to win a top prize. Please test this game a few dozen throws to make sure it is not too easy or too hard! Generally you want for 1 in 10 kids to win a top prize. So... when giving 3 chances for each player that is 30 bean bag tosses to pop a ballon! If the game is too easy, require that they pop 2 balloon instead of just 1 to win a top prize! 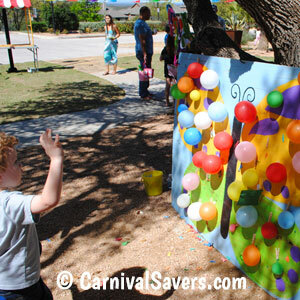 Kids line up in droves to play this fun alternative dart balloon game! Todder standing a few feet closer to toss the beanbags. Allergy Information: We just learned that people who have severe latex allergies can have a reaction to bursting balloons. For schools, it may be wise to talk with administrators to verify all child allergies first. Also, consider changing this game to the "Butterfly Bean Bag Toss." Cut out 4 - 6 holes in the wings for the bean bags! 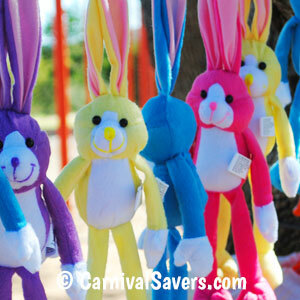 SPRING PRIZES and SUPPLIES for the BUTTERFLY BALLOON BURST GAME!